See attached race notice from Inny Kayakers for the next classic race. This race is a selection race to qualify for the National team. Reminder - closing date for applying for National team selection is 20th February 2019. See attached the race notice for the Templemills classic race on the 10th February. 2019 selection policy can be found below. 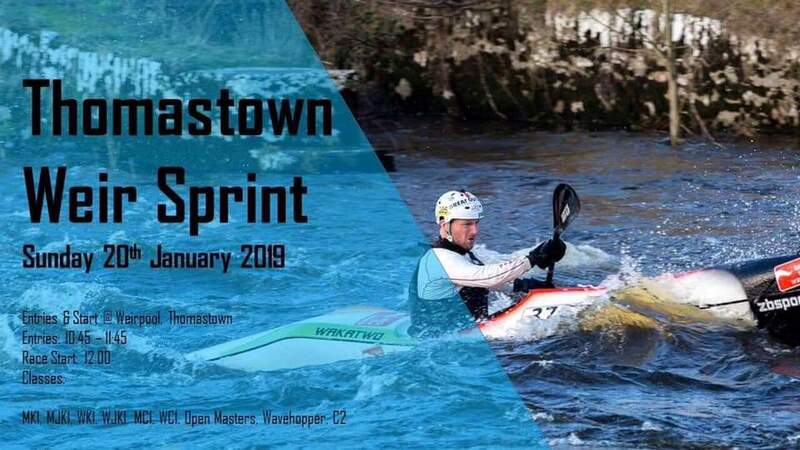 See attached race notice for Thomastown Sprint on 20th January. Hope to see you all there. 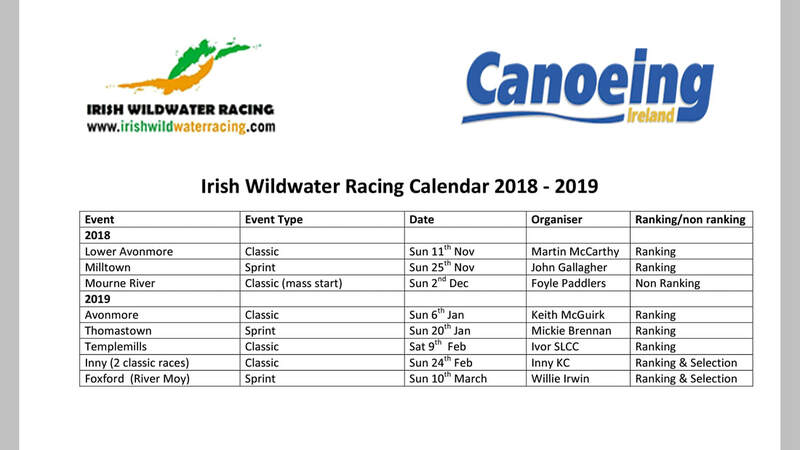 Please see attached for updated 2019 calendar and take note of any changes. 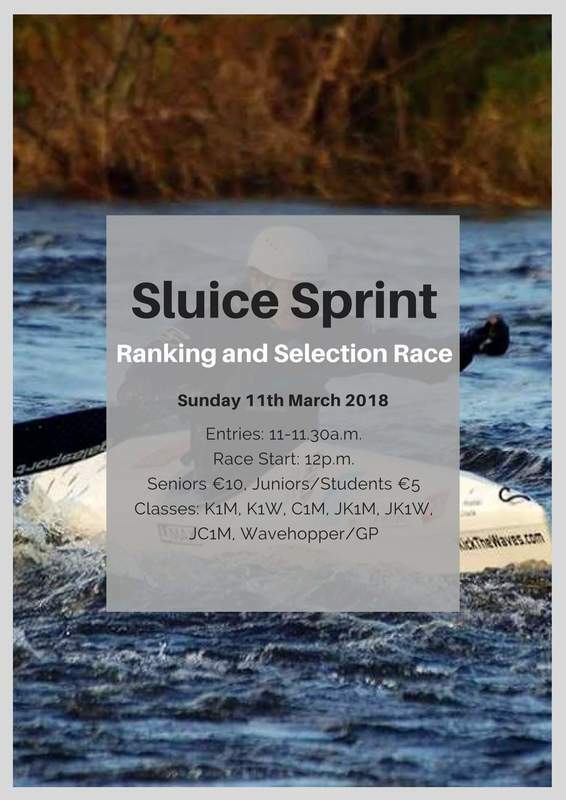 The committee have removed the Aghade race and the selection race at Sluice has been moved to a new venue on The River Moy Foxford County Mayo. The Foxford site hasn’t been used in a number of Years and we are excited about taking WWR back to Mayo. The committee has received €1000 sponsorship which will be used to encourage race participation. This €1000 will be split into 5 x €200 vouchers for different retail outlets/hotel breaks. Opportunity to win the vouchers will be open to all race entrants, regardless of class who are compliant with the rules below. · The paddler must also compete in the River Moy race at Foxford. 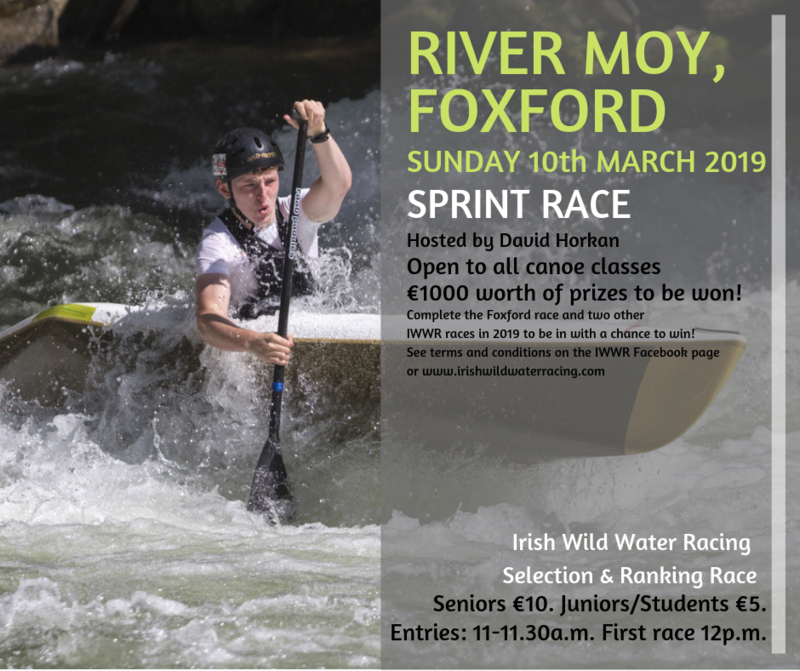 · Each race a paddler competes in he/she will receive a ticket and at Foxford all tickets will be entered into the draw, the 5 winners will be drawn from this. 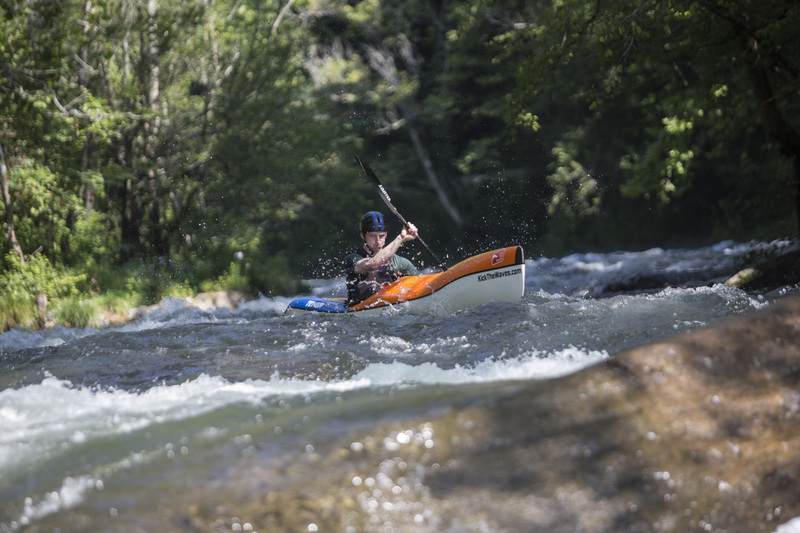 · A paddler can only win one prize. 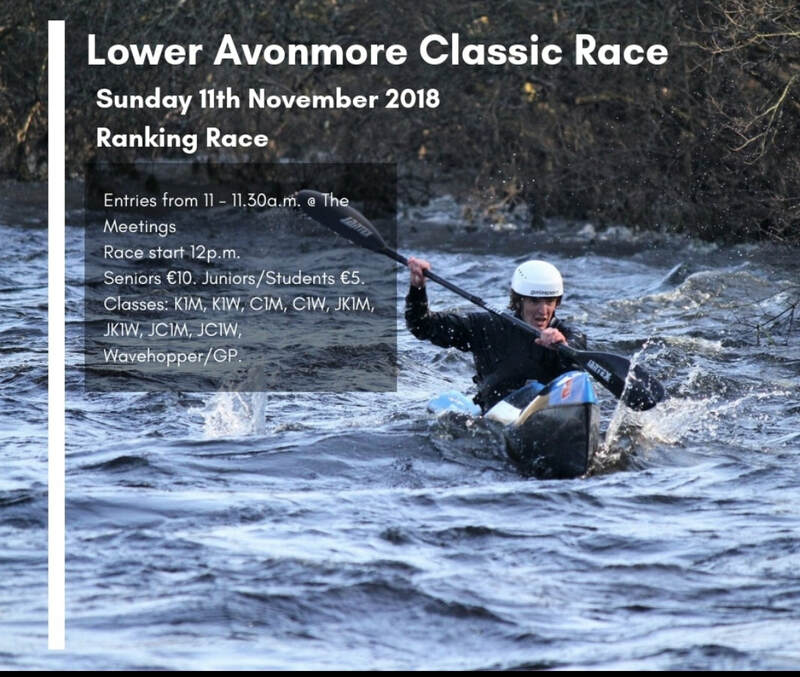 Results from Lower Avonmore Classic Race can be found here . A really big thanks to all who helped out, both on the day and in advance: Mollie Claffey for the race notice, John Clarke, Sinead Foley, Doc Martin for timing and Tom Claffey for timing and pre-event organising! DARRAGH CLARKE HAS COME FIRST PLACE IN C1 CLASSIC. HE IS THE EUROPEAN CHAMPION! Darragh starts at 08:33 Irish time. Well done to our athletes who raced this morning in the classic race on the Muota river over a very difficult stretch of river. 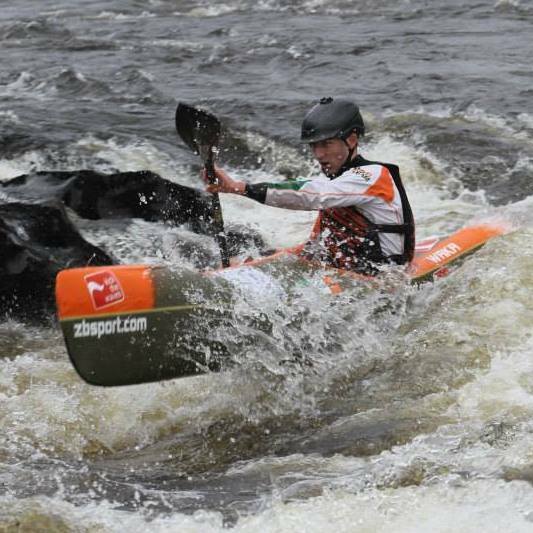 In Mens K1 Odhran McNally finished in 28th place in a very fast race against a field of 70 other athletes. 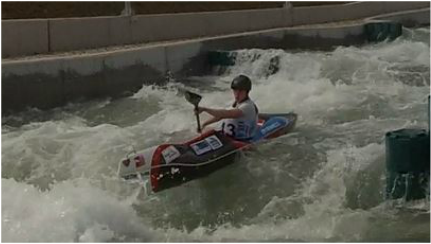 In Ladies C1 Meave Martin, who is still a junior paddler & competing in her first international competition, finished in 13th position. Saturday sees our athletes in action again in the shorter sprint race! Wildwater Kayak Club are selling some wavehoppers. These are several years old and have been repaired, but would be fine for someone starting out in wildwater racing or someone who wishes to progress from more stable non-racing canoes into something faster on easy rivers or flatwater. For further information, please contact Martin on 085-1742261. 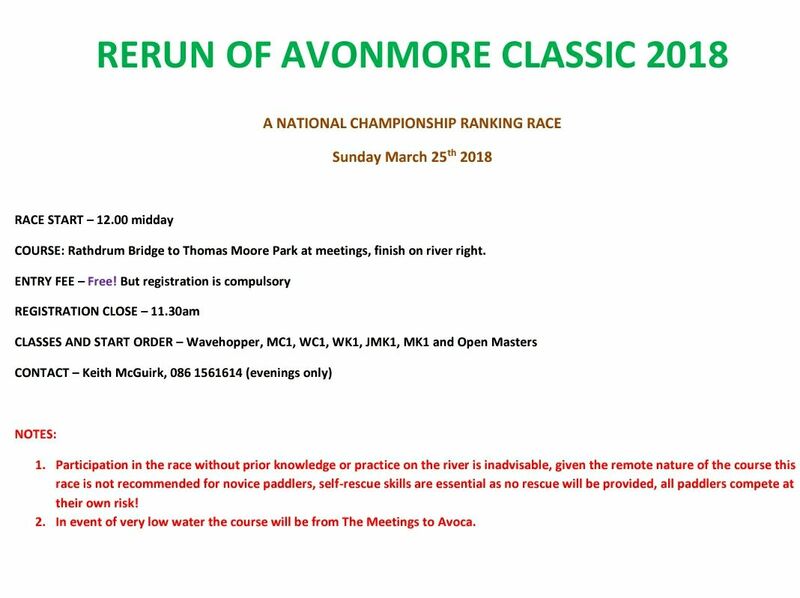 The Avonmore race has been rescheduled. Please see updated calendar. 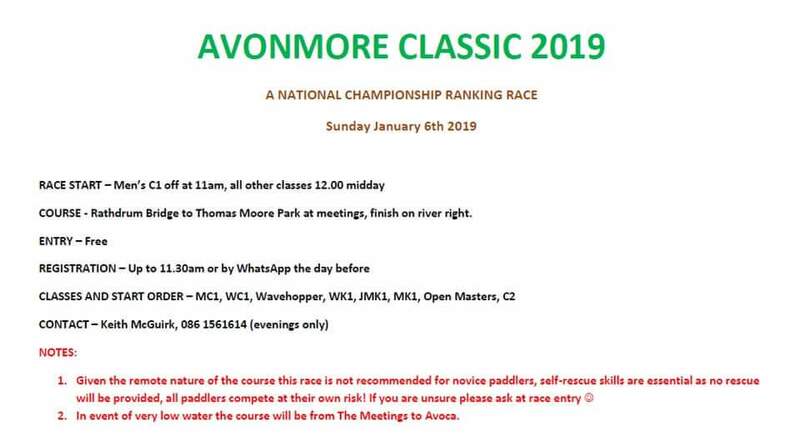 Due to the high volume of rain expected on Saturday through Sunday we'd like to remind paddlers that due to the remote nature of much of the course, the Avonmore race is not suitable for novices and that airbags (as per the rules) are compulsory for all boats. 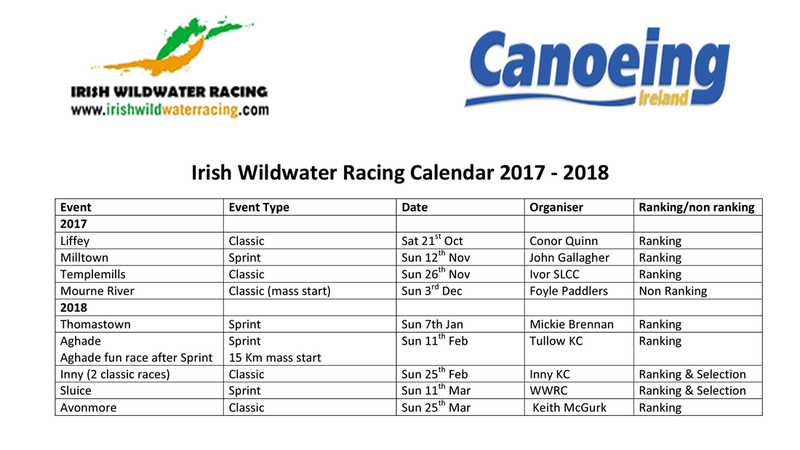 First Wildwater Race of 2017-18 season kicks of this Saturday on the Liffey. For further details, please click here. Big congratulations in order for paddlers Darragh Clarke, Mollie Claffey and Mickie Brennan on their victories at the WWR British championships! Then Darragh alongside his C2 partner Mickie Brennan drew in the C2 sprint and won the classic race by a massive two minutes. Not letting the Girls down, a big congratulations also to Mollie Claffey who achieved 3rd Place in the womens U23. An outstanding weekend of results for the Irish paddlers. Mourne Training Weekend Postponed - Sorry for the short notice but we have decided to postpone the Mourne training weekend due to the lower than expected water level. 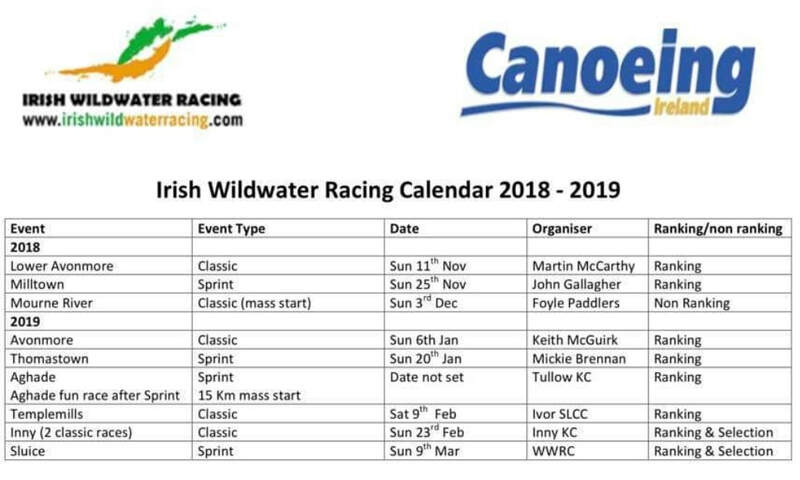 We believe the river to be still well paddleable and the race organised by Foyle Paddlers will still go ahead on the Sunday but the training weekend shall take place sometime early in 2017 when hopefully conditions will be more suitable for numerous river runs. Details will be circulated closer to the time. 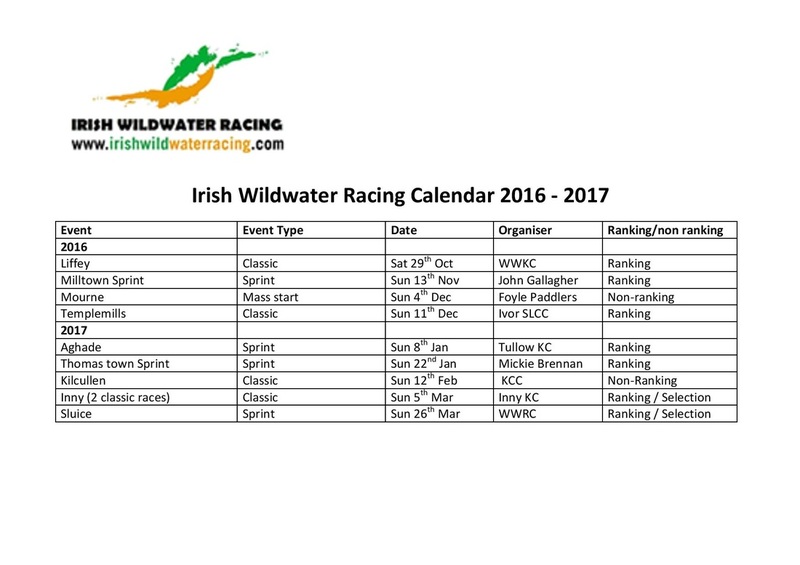 The 2016 Wildwater Racing AGM will be held in the Phoenix Room, West County Hotel, Chapelizod, Dublin 20, on Friday 2nd of September at 7.30 PM. Coupled with the AGM will be the presentation of Medals to our 2015-16 National Champions. 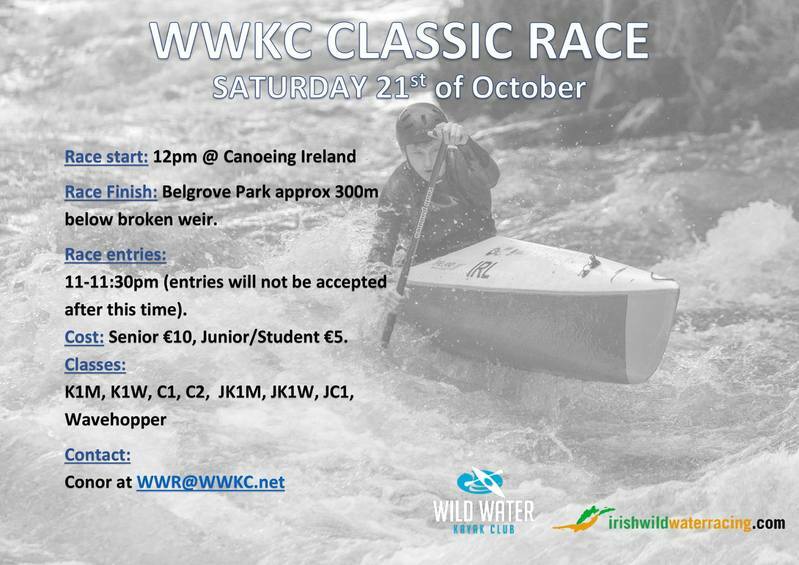 Please forward any correspondence or motions to ‘secretary@irishwildwaterracing.com’. 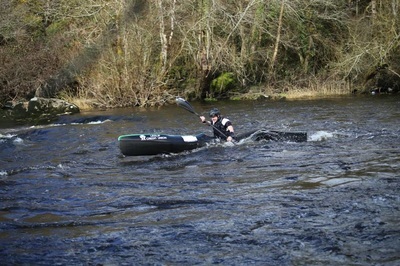 The last of the Wildwater Races for the 2015-16 season took place last weekend at Sluice on the river Liffey. Results are here. Well done and thank you to everyone who raced this season and we also wish to express our appreciation for those who organised and helped to organise races throughout the cold and wet winter months! On behalf of the WWR Committee, thanks again and see you all next season! 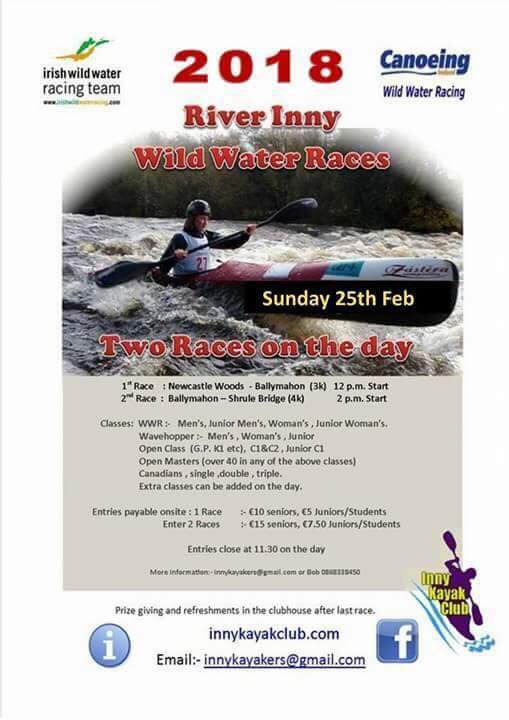 The final race of the 2015-16 season takes place next Sunday at Sluice in Lucan. This event is the also the final event for the national team selection. Race notice can be found here. 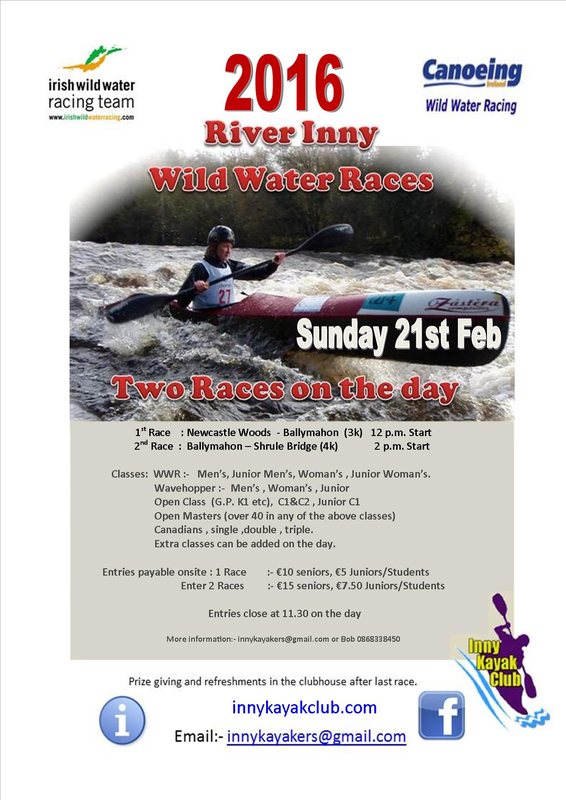 Results from the two classic races, on the Inny, hosted by Inny Kayakers on 21st of Feb can be found here. 2016 National Team Selection Policy can be found here! 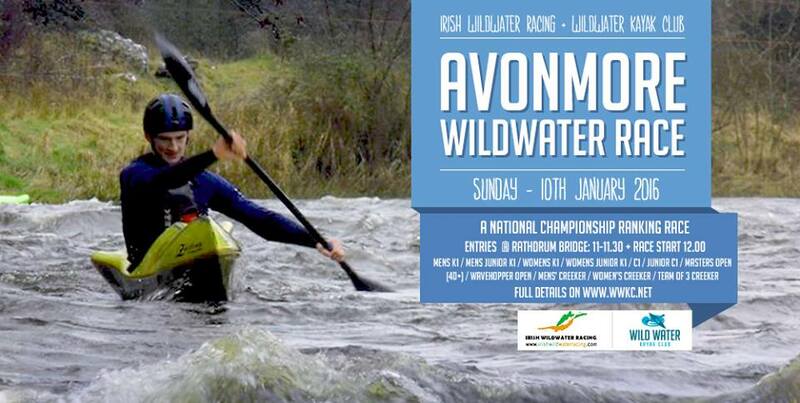 Avonmore Wildwater Race, Sunday 10th January. Race notice can be found here. 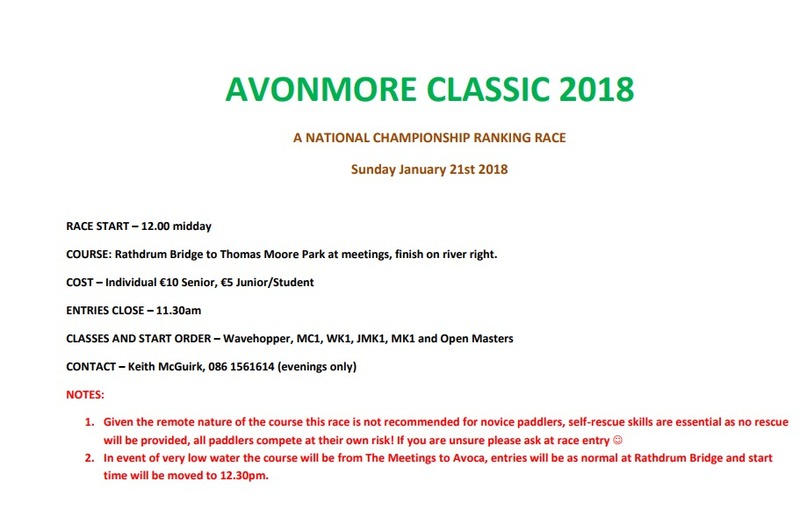 Note that given the recent flooding, race course may be altered on the day or at short notice (alternatives include the Meetings to Avoca - to ensure competitor safety). Watch this space for updates! 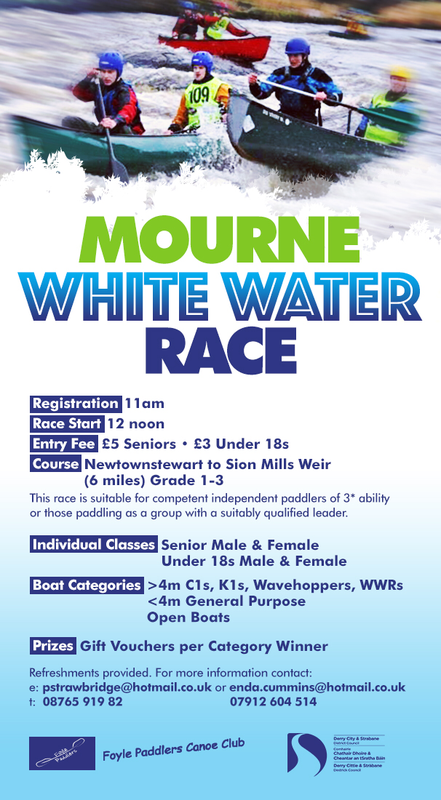 Important notice - Mourne Wildwater race originally scheduled for Sunday 6th December has been cancelled due to storm Desmond! 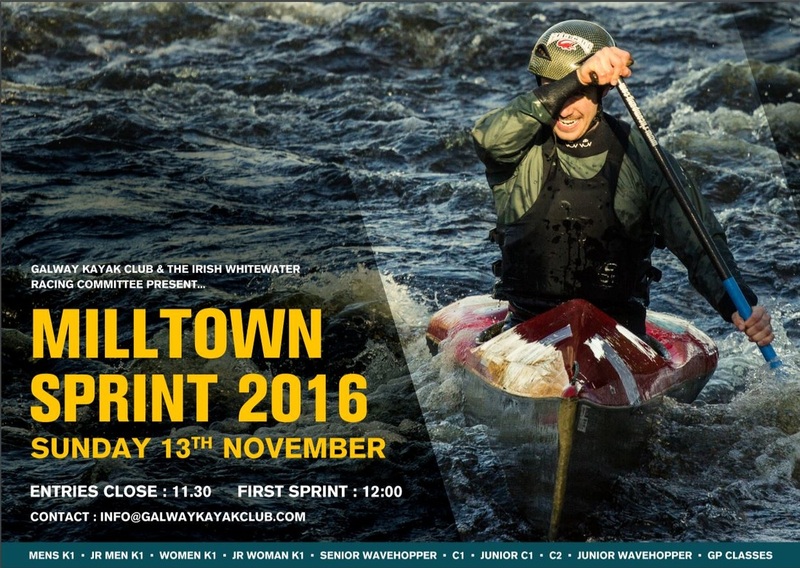 Please see here for results from the Milltown Wildwater Sprints held at the weekend. A big thanks to GKC for running an excellent event! 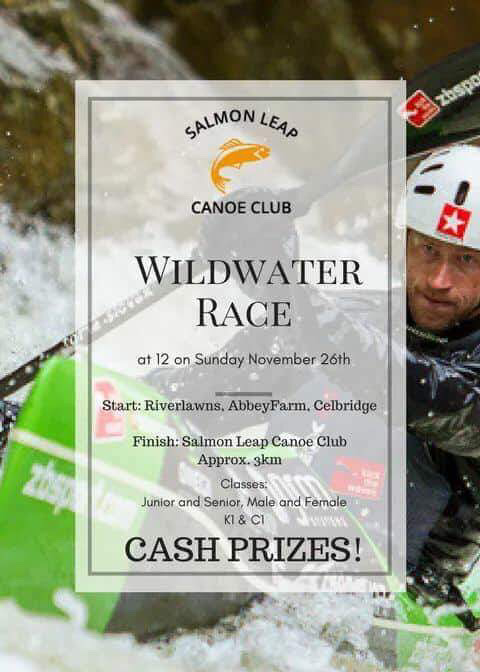 Please see here for results of the Corrib River Wildwater Race, held on Sat 28th of Nov. Epic conditions for those who raced. A big thanks to Galway KC for running the event. 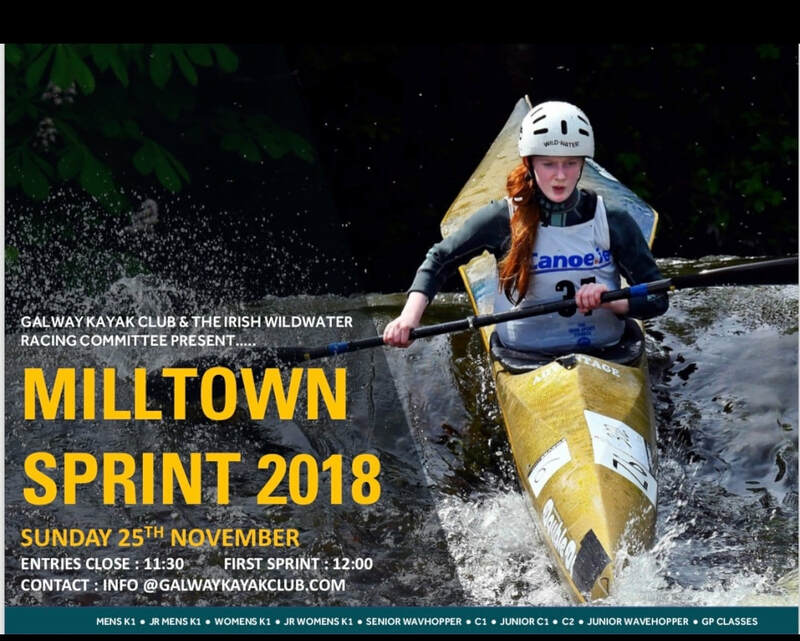 Results from the Milltown Wildwater Sprints to follow shortly. 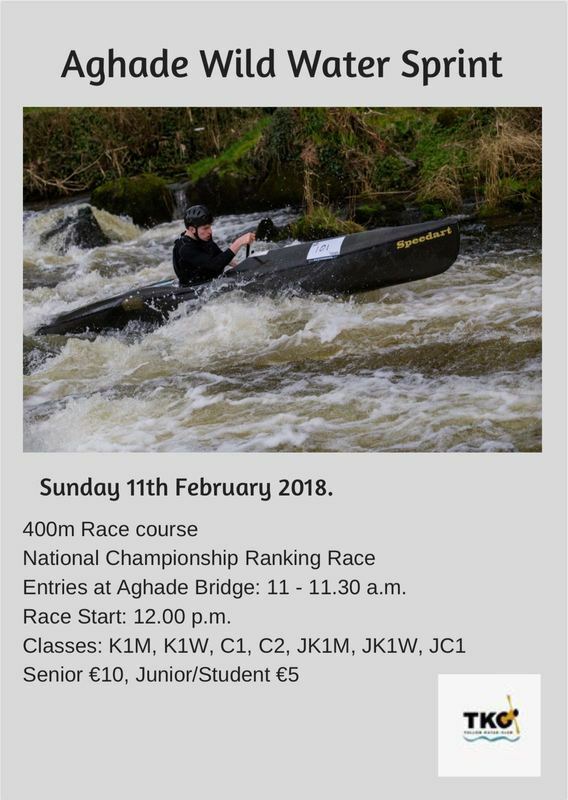 Please see here for Corrib race notice and here for Clare River race notice. These events take place on Saturday 28th and Sunday 29th of November respectively. Lots of rain recently, so if the weather plays its part over the coming week, we could have excellent conditions for these events. Please watch this space and/or contact the organisers closer to the event to check up on conditions - we are monitoring the situation closely. See here for results from the Aghade Wildwater Sprints, held on Sunday 8th November. A really big thanks to Tullow KC and the Rothwells for hosting and organising the event. They put on a great show in the windy and wet conditions (perfect conditions for paddling, terrible for organising a race)! 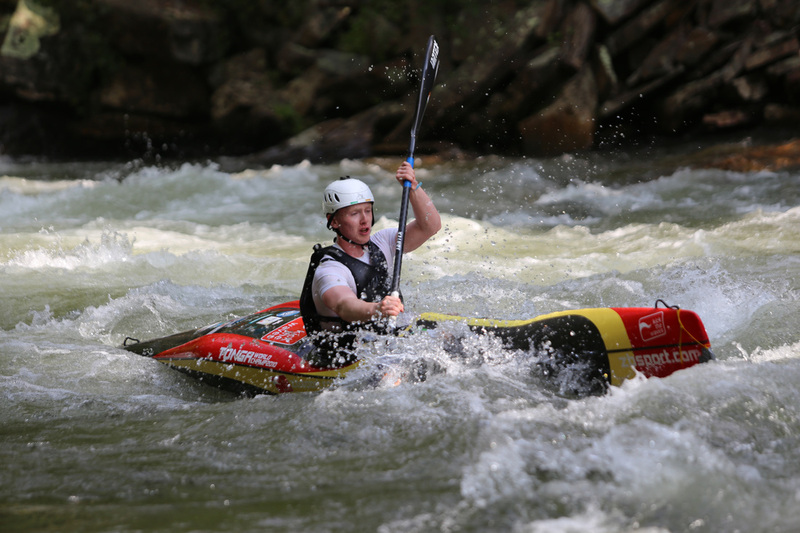 Thanks to all those who attended the Wildwater Racing AGM recently and showed their support. 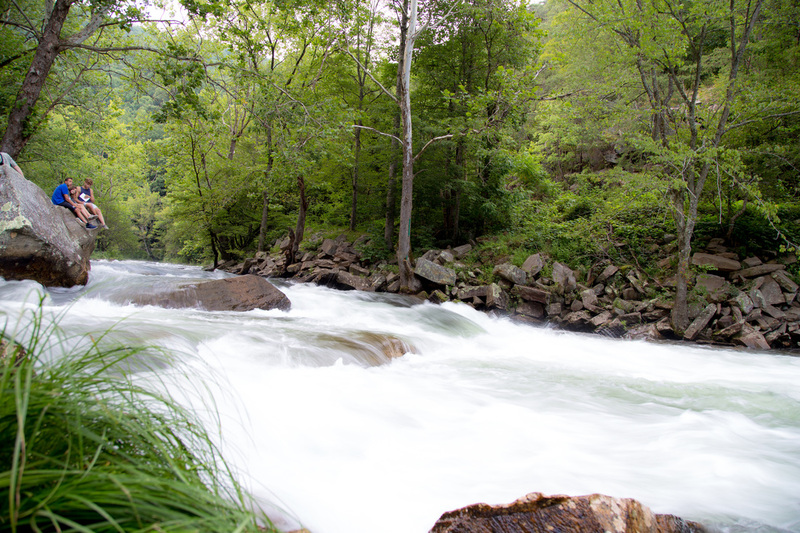 The 2015 World Champs in Nantahala North Carolina are now all finished and the athletes have all returned home safely and extremely happy with their results. The young Irish athletes are exhausted after competing in almost every race! having three of the athletes to make finals of the sprint is a major achievement. 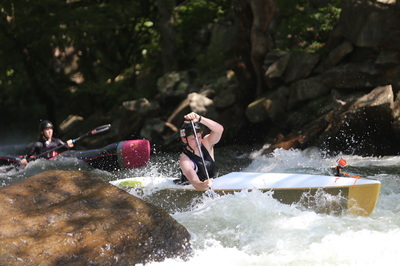 The Classic course had some excellent features and good sized rapids combined with some flater slower moving water where speed could really be pushed to the maximum. 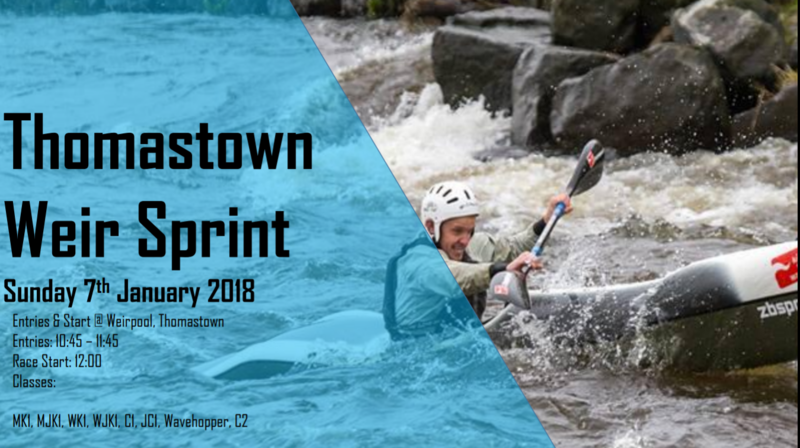 The Sprint course was both fun and technical with a variety of different racing lines to choose where the best of the best try to shave seconds of their time, a longer course than Vienna's sprint course this year at an average time of 75 seconds ( the fastest K1 men's with 64 secs). The main part of both the sprint and the classic course was the fantastic Nantahala Falls, a steep drop at the end of a massive wave train with a few sneaky Rocks hidden among it, that caused more than a few problems for a lot of the international athletes early, including ripping the skeg from the Clarke Brothers C2 during their sprint race! 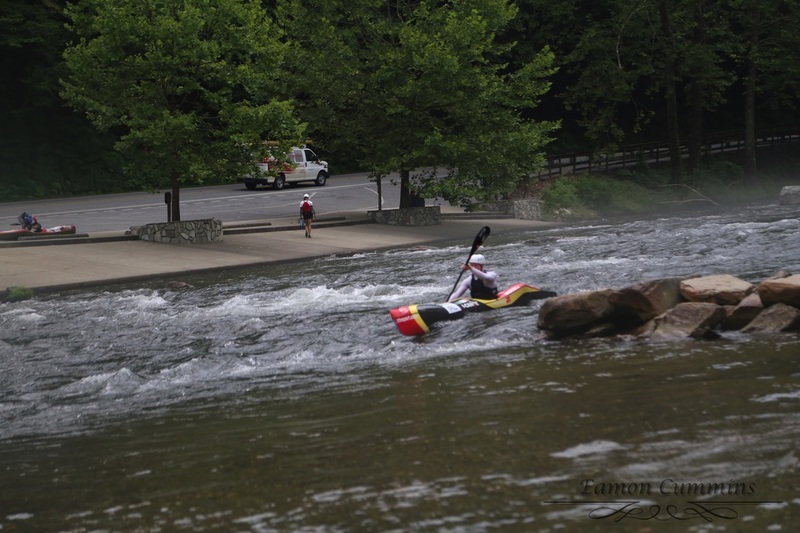 An Amazing feature of the Nantahala River is its dam controlled system giving the athletes consistent training on the river everyday, an annoyance would be the fact that there was a lot of raft tours during the middle of the day which obstructed the river. As for accommodation the NOC (Natahala Outdoor Centre) treated the Irish team incredibly well, being extremely friendly with the entire team and staff. The Irish team turned to cooking for themselves most nights in order to get full nutritional value. North Carolina truly is a beautiful place, Great powerful rivers, stunning Mountain Views dense green forests teaming with wildlife only too happy to sting and bite us all! Its a hard job every morning checking your boat for snakes before you get on the water! As for results all Irish athletes were extremely pleased with their races! And Cian and Darragh also only sat into their C2 for the first time at that race and managed to get 6th as well. Mollie came 20th in K1W overall , both not qualifying for the finals. Craig came 13th in the finals with a personal best time of 1.11:02. Darragh came 9th in his final, beating his qualifying time by 2 seconds with a time of 1.23:04. On a side note the men on the team all competed in the junior C1 team races to make the races official, and words cannot describe how funny it was seeing Craig and Cian try and paddle 4 metres in a C1 complaining how sore their knees were. All athletes enjoyed their trip to the United states and were very tired travelling home, for some of the team taking up to 27 hours of traveling by air, land and sea! All athletes are ready for a short rest and then start training for next season of Wild Water Racing. A huge Thank You To team Manager Eamon Cummins for all his tireless work and his support Team Noreen Walls, Tom Claffey and John Clarke who without the amazing trip would not be posible. Yesterday the Irish Junior team began training for the world championships in North Carolina in the beautiful 30 degree weather and picturesque Appalachian mountains, under the stewardship of the Czech coaches, Today is the second day on the course and the team are beginning to find their feet and sort out the fastest racing lines, the 3 kilometre classic course suits the athletes very well and has been compared to a combination of the Irish Avonmore, Inny, Mourne rivers. 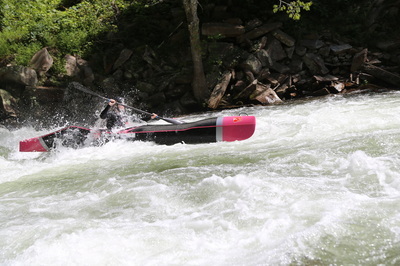 The Nantahala falls are the athletes favourite feature on the river as it is fun,technical large volume water. Stay tuned for feed back and results from the athletes over the next few days. 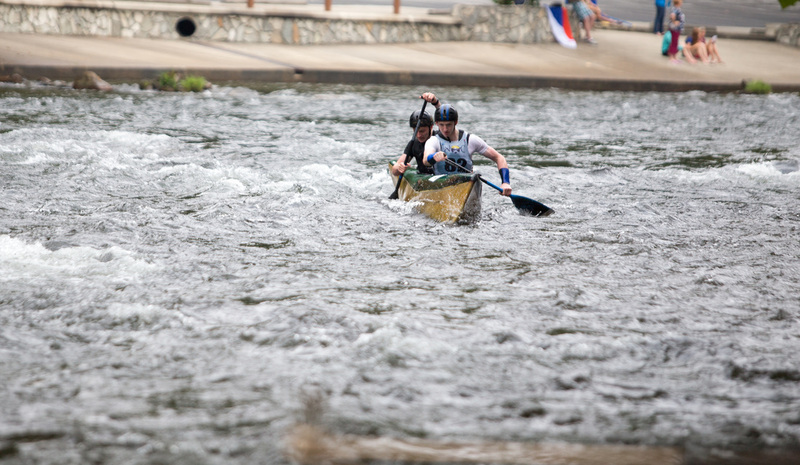 The weekend of 27th – 28th June saw the Wildwater Racing World Sprint Championships on the new artificial Donauinsel course in Vienna. Besides the new shorter sprint format (40 seconds for the winning men’s kayak run, a far cry from some sprint events in the past which were several minutes long!) the use of artificial rivers means that the sport is now changing quite dramatically for competitors. 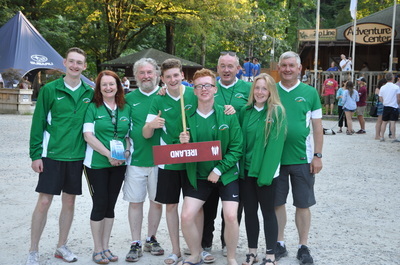 Ireland were represented by Iomhar Mac Giolla Phadraig from Salmon Leap Canoe Club and Conor Quinn from Wildwater Kayak Club (who was racing in his first senior international championship event), both of whom were racing men’s kayak. In order to make the trip easier, both paddlers had agreed in advance to rent Tonga boats from Tomas Slovak from ZBSport for the event, meaning that they could fly to the event as they’d no need to transport boats. The course itself was quite steep and pushy (flow rate of 12M3/s with three of the four pumps working), with the usual surging nature that one associated with artificial courses. The conveyor belt bringing paddlers back up to the top, while a great convenience did mean that the guys had to be careful not to overdo it in training by knocking out too many runs and risking over-tiredness or even worse forearm injury. In addition the new sprint qualification rules are in place this year, meaning that five competitors qualify for finals from the first run, with a further ten qualifying from the second run (during which none of those already qualified compete). This requires a modified race strategy for most competitors, who feel that making the final from the first qualification run is a long shot. 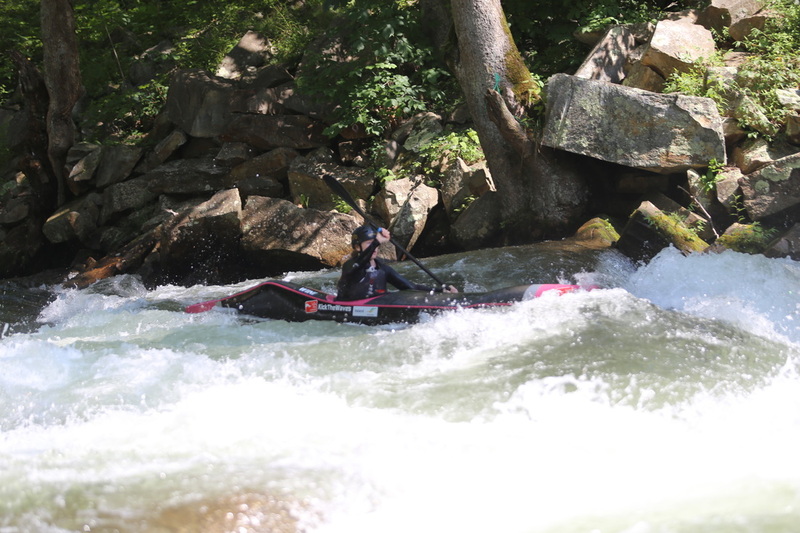 Iomhar and Conor determined that they’d paddle hard in their first run, but essentially treat it as a race pace practice run, with the intention of using it to set themselves up for the second qualification run where they would aim to produce their best performance. All of the above led to quite a lot of adaptations that Iomhar and Conor had to make to prepare for the event, but given limited time and budget, these are just some of the challenges facing competitors. Both guys were very comfortable on the water and it was really a case of them both performing on race day and being able to re-produce their best form from training when it really mattered. The fine margins which result from such a short race on such surging water mean that luck plays a part too. Race results are far harder to predict in such events than might be the case in classic events or longer sprint events on natural rivers. This may be best demonstrated if one looks at the results of the Czech C1s, some of whom would be familiar to Irish paddlers, given the amount of time they’ve spent in Ireland. The most favoured Czech paddler, reigning World Sprint Champion, Ondrej Rolenc, ended up in tenth place and their reigning World Championship Bronze medallist, Antonin Hales came seventh, with Lukas Novosad rolling back the years and finished with an excellent fifth! There really is a trade-off between risk and reward with the new event format. One major casualty of the unpredictable nature of the course was Tobi bong, double World Champion from Germany, who eddied out in his final run, when trying to power down the course, with the result that he finished last in the final. Both Irish competitors put down very solid first runs, with Conor ending up in 30th place with a time of 45.74 and Iomhar 32nd in a time of 45.98 out of a field of 54, but both knew that they could improve on second runs. When second runs came around, Iomhar raced to a time of 46.32 for a final place of 36st and Conor managed a time of 47.45 for 40th place. Both of these results are very good and the guys, while knowing that they didn’t produce their best possible run, should be very happy with these results. Not only is there room for improvement right now, but armed with the experience of this championship, the two guys can better prepare for next season’s international events and can hopefully share this knowledge with the other paddlers at home hoping to race internationally next year. 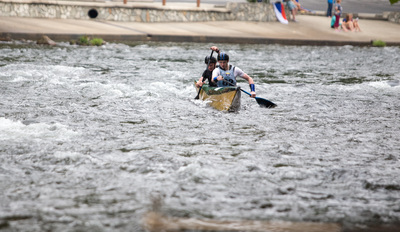 Some of the main changes in the sport when racing on shorter artificial sprint courses include greatly exaggerated body movements in the boat to time the strokes with the waves, keep the pitch of the boat flat and in effect kayaks are now being paddled more like C1s in such races, as if competitors are seeking to increase their leverage while still ‘running dry’. There were some notable examples of this amongst the top paddlers, particularly the French, who were the most successful nation at the championships. Some of the body contortions being produced by paddlers on the difficult course demonstrated extremely high levels of skill and commitment. One perhaps surprising aspect was the relative lack of new boat designs at the event. Typically at a World Championships one might expect to find several new designs unveiled. The only apparent new design on show this year was from Prijon in Germany. Their new kayak, the Pursuit is based on the Loisach, which was a very manoeuvrable and forgiving boat. The Pursuit has a remodelled deck to give it more volume and is apparently slightly less forgiving than the Loisach but quicker and responds very well to even a slight lean/edge. It was paddled to very good effect by Tobias Gandl from Germany and the McIntyre brothers from Australia. The event was spectacular to watch and the two guys did Ireland proud. As usual the atmosphere was top notch and the camaraderie amongst the teams great, which really adds to the event! Photos from the racing at the World Champs in Vienna can be seen here. After 4 days training on the course the boys to nail their lines at full pace. The course is a lot bigger than it looked in the videos, the course is very pushy and technical. The boys spent the first few training sessions getting used to being back on whitewater again. But in this Morning session they were doing some solid and fast runs. They have one more training slot in the afternoon and then tomorrow is race day. Racing gets underway at 10:00 tomorrow K1W, then C1M, then @ 11:15 K1M. Start list is still provisional but we will update you with start times when they become available. The heats are taking the same format as the new slalom format. So top 5 in the 1st heat will go straight to the final and then the top 10 from the 2nd heat will go to the final. 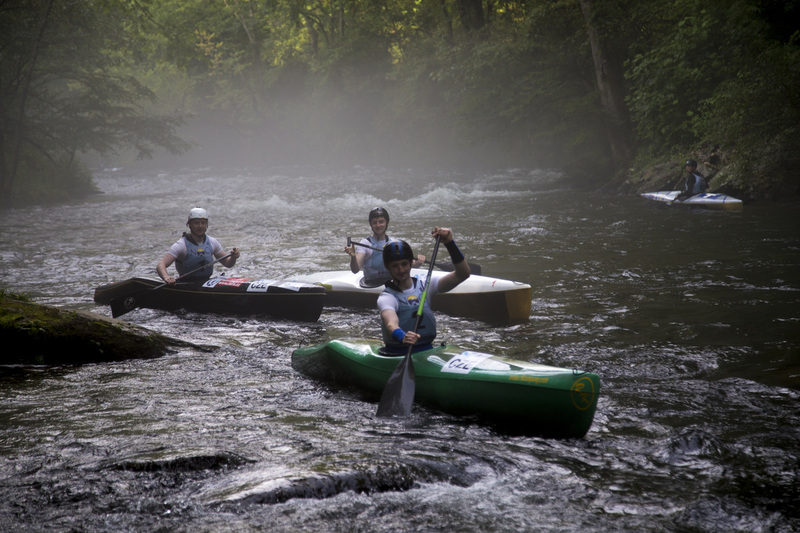 Senior Wildwater Team 2015, from left to right: Conor Quinn (WWKC) and Iomhar Mac Giolla Phadraig (SLCC). Conor and Iomhar will be traveling to Vienna, Austria next week for the 2015 Senior Wildwater Racing Sprint World Championships. 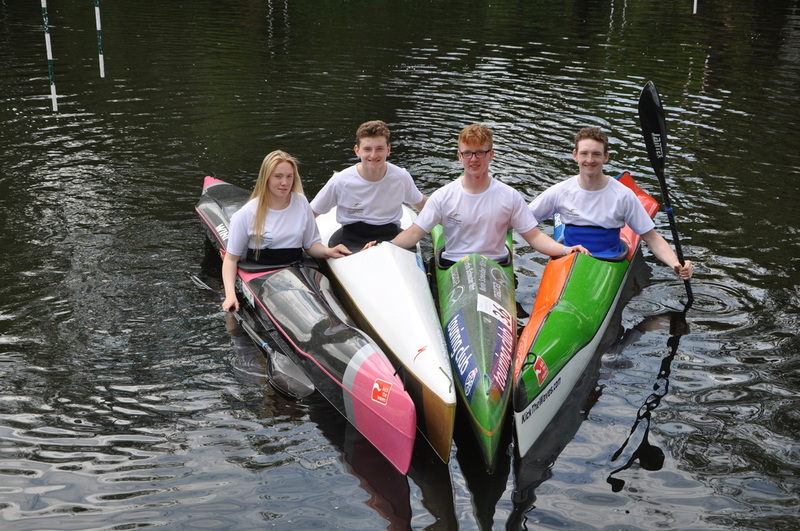 Junior Wildwater Team 2015, from left to right: Mollie Claffey (WWKC), Darragh Clarke (WWKC), Craig Cummins (SLCC), Cian Clarke (WWKC). 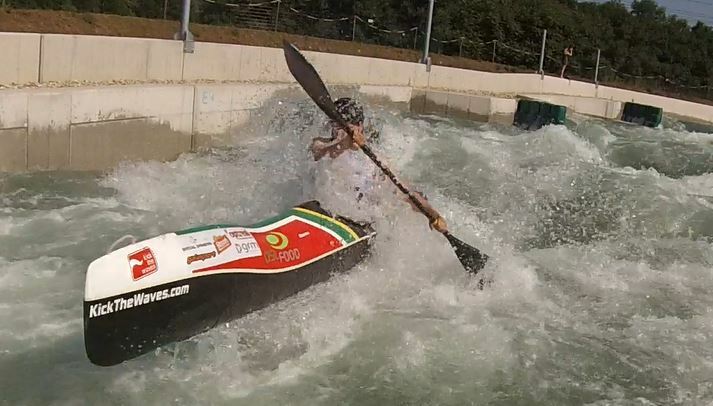 In late July, the Junior Team will travel to America for the 2015 Junior Wildwater Racing World Championships.